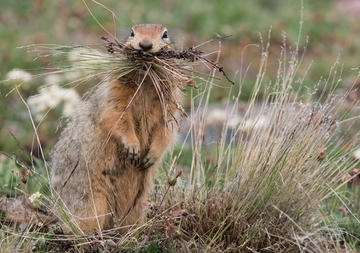 No, this isn’t some ground-squirrel gourmand stuffing his face at suppertime. Instead, he’s in the midst of some interior decoration. The Arctic ground squirrel (Urocitellus parryii) builds underground nests lined with grasses, leaves, lichens, and whatever stray animal fur it can find. It goes out of its way to create a comfortable home since it’s going to be there for a while—from August or September until April, it hibernates through the long Arctic winter. When the squirrel emerges in spring, it’s time for mating season. Pups are born a month later and must grow strong quickly in order to withstand the winter ahead.